Still on a food kick here. I was talking to a friend today about easy, nourishing meals that the kids will eat, but that don’t require hours of time in the kitchen. Another friend shared this recipe with me and I modified it to suit my needs. We always have beans, tortillas and salsa in the fridge so these are super easy and convenient. This version happens to be vegetarian, but I admit I do like some ground or shredded beef in addition to the beans. IIf you’re like me you always adjust recipes anyway, so have at it. Heat oven to 400. Grease cookie sheet or baking pan. Warm the tortillas in the microwave. They should be just warm enough so they don’t break when folded. Place one tortilla on the greased cookie sheet. Spread beans, onions salsa and cheese on one side of the tortilla. Then fold the other side over in half like a taco and set bottom down in the baking pan. 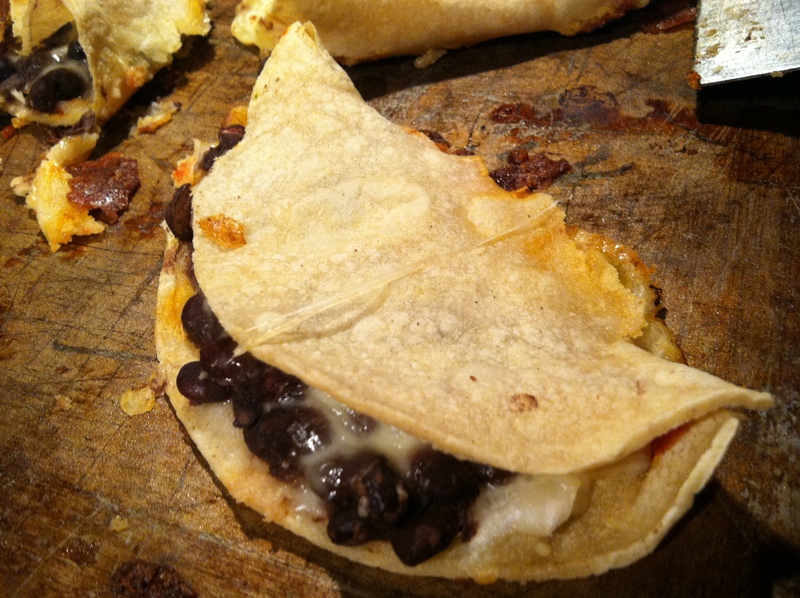 Two tablespoons of beans will fill the taco and let some beans and cheese ooze out as they bake. We like this, especially when the cheese gets bubbly. If you like less filling try a spoonful of beans. Repeat till you’ve filled all the tacos. Stick pan in oven and bake till golden brown. Takes about 15-20 minutes. I need a picture of these. Excellent! I made them last night and they cracked at the bottom. I figured I did something wrong, but yours are the same. 😉 My husband loved ’em! awesome! I’m so glad. Did they hold together? or crumble?